Robots are ultimately going to be a part of daily lives in the future. To make robots do what you desire, they need to have the appropriate hardware and have to be programed so as to fulfill the need of the work. The greatest challenge when it comes to robots is to create robots that can move around in the human world, performing tasks that are beneficial to people and perform a task to the desired satisfaction autonomously. Although a lot of robots in todays world are autonomous but they are highly constraint to the surrounding. They rely solely on the sensor inputs and the program they have in their memory. If you put the robot in a never before situation, the robot has to plan/process a strategy all over again. What if robots had their own social network where they share, download experiences and information of performing certain tasks? Thats what a group of robotics engineers at the University of Technology in Eindhoven at Netherlands in collaboration with other European research institutes are working on, developing an Internet for robots basically a database of codes which robots can download. The name of the Project RoboEarth, With this Robots will be able to learn from each others capabilities and will master new movements, all it needs is an internet connection to the robot. 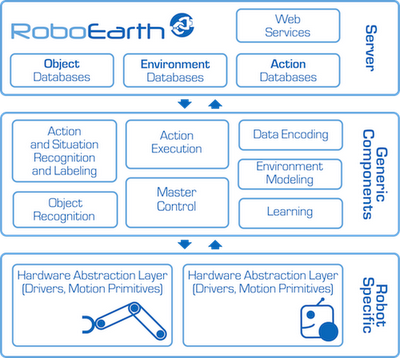 RoboEarth will be an all inclusive system which will basically close the loop from robot to RoboEarth to robot. 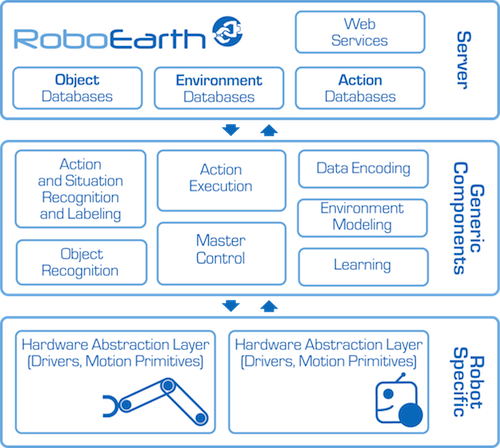 RoboEarth will be an internet based database implemented on a Server with Internet and Intranet functionality. It will store information required for object recognition (e.g., images, object models), navigation (e.g., maps, world models), tasks (e.g.,manipulation strategies, action recipes ) and hosts intelligent services (e.g., offline learning,image annotation ). You can call it the ultimate encyclopedia for robots. 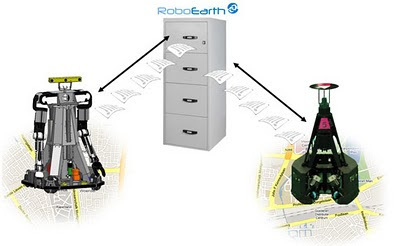 The development of a database allows RoboEarth robots over the world to learn from each other. It will take several years before robots on a large scale could do it. This technology will definitely take us one step closer to the robot age. Here is a video where a TU/e Robot named AMIGO downloads information from RoboEarth to execute the task of providing a drink to a patient on a bed without spilling.